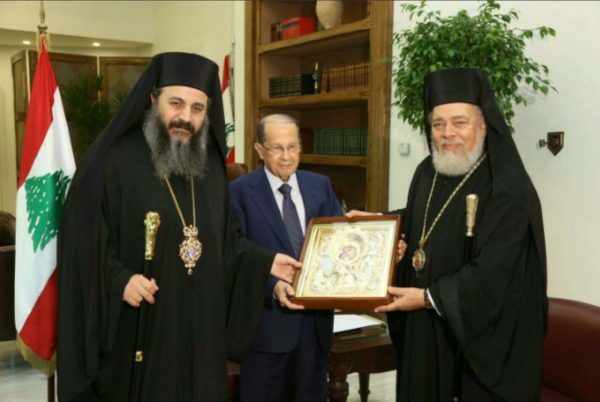 On November 5, 2016, the President of the Republic of Lebanon Mr. Michel Naim Aoun met with hierarchs of the Orthodox Church of Antioch – Metropolitan Niphon of Philippople, representative of the Patriarch of Antioch to the Patriarch of Moscow and All Russia, and Metropolitan Anthony of Zahle. During the meeting, Metropolitan Niphon conveyed to the head of state a copy of the congratulatory message from the Primate of the Russian Orthodox Church in Arabic. ‘It is gratifying to see that Lebanon has remained through centuries a common home for both Christians and Muslims. Today it has also become a refuge for thousands of people fleeing from the hostilities in Syria and Iraq. I hope that under your guidance the Republic of Lebanon will preserve its glory as a land in which Christians live in peace and harmony with people of other religions, making their own contribution to the building of the country and looking with confidence to the future’, the message states. It was sent on November 2 by His Holiness Patriarch Kirill of Moscow and All Russia on the occasion of the election of Michel Maim Aoun as President of Lebanon. Metropolitan Niphon also presented the president with a copy of the Fydorovskaya Icon of the Most Holy Mother of God and explained to him the history of this image with which the first Russian tsar from the Romanov family was blessed for his reign.